MP4, MOV, and are supported. Convert FLV to AVI, MPEG, DivX, XviD, WMV, 3GP, MP4, RM, MOV. Convert DivX, XviD, WMV, 3GP, MP4, MPEG, AVI to FLV video file. Convert MP3, M4A, AC3, AAC, WMA and OGG to audio-only FLV file. 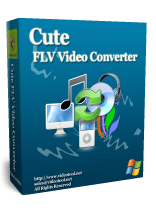 Go ahead to download Cute FLV Converter Free Version ! It's 100% FREE! PSP, PS3, Xbox, Mobile Phone, BlackBerry,sony walkman,Microsoft Zune,Archos,Cretive Zen,iRiver,Sandisk sansa,Xbox 360,Nitendeo WII,Toshiba Gigabeat etc. H.264/AVC, TS, AVCHD, MKV, MPEG-2 etc. Extract MP3,M4A,WMA,WAV,AAC,OGG and AC3 audio files from video files. Allows you to make adjustment to video frame size, frame rate, bit rate,audio sample rate,audio channels and so on. All the video editing features are WYSIWYG and suitable for all users. The rich features of Cute FLV Video Converter can meet your demands. Batch-convert video files from AVI,DVD:VOB,MPEG,VCD:DAT,MPEG,MPEG-4,WMV,Asf,DivX, ASF, VOB, 3GP,3G2,H.264,MOV to FLV video format. How to Publish FLV video on your homepage or blog. Portable media players and mobile phones commonly support AVI or MP4 formats. PSP, iPod and Zune support MP4 format. You can convert downloaded FLV files to MP4 or AVI format for playback on your PMP or mobile phone. Cute FLV Video Converter support custom AVI profile, which means your can virtually convert FLV to AVI format for any device that supports AVI, simply adjust the video size option. FLV files can be converted to 3GP format in a number of ways. With Cute Video Converter, it’s fast and reliable to transcode FLV files to 3GP format for your 3G smart phones, whether you get the FLV files from video sharing sites like YouTube, or from other sources. What’s more, Cute FLV Video Converter can convert AVI, MPEG, MOV, MKV, WMV, 3GP and RMVB videos to FLV format compatible with YouTube and other video sharing sites. FLV to 3GP converter is the best FLV conversion software that helps you convert from FLV to 3GP/3GPP/3GPP2 and other popular video format.In this way, you can feel free to save your favorite FLV videos from youtube to your cellphone. Moreover, with the coming out of iPhone and Zenzui, 3GP shall be the best friend. FLV file itself is fully-functional on its own and can be played or converted to other formats from local storage such as a hard disk or a CD. With Cute Video Converter, you can convert FLV to MP4, WMV, AVI, MPEG-1, and MPEG-2 videos. Why choose Cute FLV Video Converter. * All encoders and decoders are built-in. Neend't install any other codec.